I arrived at London Heathrow Terminal 3 at 0910 for my 1045 departure on AA101 to New York, a flight of seven hours and 45 minutes. Premium passengers check-in for their flights with American Airlines at Zone H, which has its own door for this flagship check-in. There was no queue and I had no bags to drop-off, so I collected my boarding card and then went back outside to go back into the terminal via the door for Zone G (strange layout) then walked to the escalators which took me up to the Fast Track security. Security was pretty quick (five minutes) and then I went to the Flagship Lounge. This is a large area with several distinct spaces. The entrance takes you past the washrooms and showers, and then there is a central area where most of the buffet food was. Since it was still early, this was set up for breakfast, with cereal, fruit, pastries and lots of fruit juice options. Further into the lounge there is a work area with one space for computers and those with their own laptops, another area for those wanting quiet and then a general sitting area. There are also toilets and showers, magazines, newspapers and a fair spread for breakfast. There are lots of power points between each pair of seats (two US sockets and two UK sockets) and windows looking out to the Air Canada, Virgin and AA aircraft at their gates. The screens in the lounge were not working, so all flights were being called. At around 1010, our flight to New York was called from Gate 34. It was a five-minute walk down to the lounge. Boarding had not started so I sat down. At 1020 there was an announcement that “…as you have just seen, the crew has only just boarded and once they have completed their duties, general boarding will commence“. There was then a further wait until, at 1045, the original departure time, boarding began. This was first class first, then business. The gate was crowded, it was difficult to get close, and as I waited I could not understand why it had been necessary for the premium passengers to leave the lounge to add to the congestion at the gate, and why there had been no explanations or apologies. Once on board there was no greeting from the flight attendant. I simply showed my boarding card and was directed onto the plane. I stowed my belongings, took off my coat, and then a while later drinks — Champagne, orange juice or water — and newspapers were offered and my coat was taken. There are overhead lockers above all the seats, and the seat itself has a small amount of stowage, with a space under the tray table for some items, and a magazine pocket close to the aisle. The angle of the seat also means you can place items such as books or a magazine on the seat next to you under the arm of the seat. In fact, for most of the flight as I worked on the firm table and used the inseat power to keep my laptop going, I had my laptop bag by my feet and even with that there I had plenty of room. These are excellent seats, good for sitting and relaxing, and also when turned into a fully-flat bed. 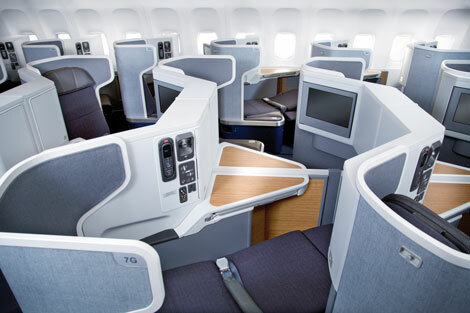 This B777-300ER aircraft has eight first class seats, 52 business seats in two cabins, 30 Main Cabin Extra Seats and 220 Main cabin (economy) seats. 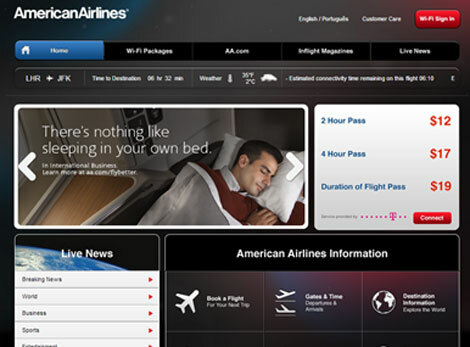 Note that if you are in the main cabin, AA has installed 10-across seating (3-4-3). 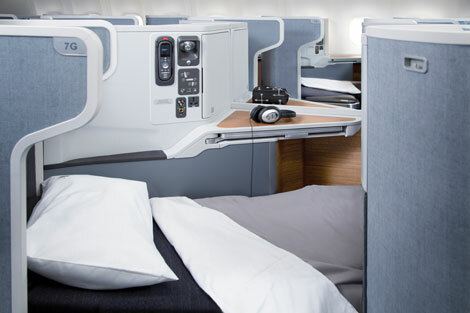 The business class of 52 seats is in two cabins, one small cabin of only two rows (3-4), and then the main business class cabin which runs from 5-15. To see a seat plan of the aircraft, click here. I was in seat 9A, a window seat about halfway down the larger of the two business class cabins. This seat is American’s new fully-flat seat in business class, and is very similar to many of the business class seats which are flying today (Cathay Pacific and Delta, for instance). It is in a 1-2-1 configuration, with the seats by the window (A and J) facing the windows, and the two middle seats angled towards one another. It offers a large amount of privacy in this configuration, so much so that the lady opposite me in the centre seat, when she wanted to speak with a member of her family, had to lean out into the aisle and call back to her relative. For an interactive guide to the aircraft, click here. Avoid row 11, which has no windows because of the support for the wing. I’d also avoid the front row (five) because of galley noise, and probably the back row (four) of that smaller front cabin for the same reason. The captain came on to explain that the reason for the delay had been a problem with the jetty, and this, along with strong headwinds, would delay us so we would not land in New York until 1425. For those making connections, the ground staff had been alerted and would be ready to help when we arrived. Around this time, about 1215, the flight attendant took the orders. These were taken from the back of the cabin moving forward, but no drinks were offered at this stage. The trolley arrived at my seat at 1225. I had the chicken, which was filling and quite tasty, and then made the mistake of having the ice-cream sundae with all the toppings instead of just choosing one which was too much of everything but my own fault. The flight was without incident, so I got on with work using the individual seat power which takes EU, US and UK plugs without adaptors. I was tempted by the inflight wifi but in the end used the time to catch up on emails without receiving any more. The IFE screen swings out from the side of the seat in front and has to be stowed for take-off and landing. I thought they were being slow about turning on the IFE, then realised people were already watching films and so my system was not working. I pressed the call attendant button and then a few minutes later when one walked past asked her if she could help. She said she would reset the system, which she did. The system still did not work without a problem, however, so in the end I abandoned it and just worked. I should also say that everytime there is an announcement (turbulence/buckle seatbelts, duty free service starting) it comes through the IFE system, pausing your entertainment. This can be quite annoying. About 90 minutes before we were due to land a light meal was served with a choice of entrees — Uno’s Four cheese and pesto pizza served with a green salad; Tandoori Chicken Cold Plate. I chose the chicken again, but the cold taste of the curried chicken skin wasn’t so good. Dessert was a chocolate caramel mousse. I was watching a film at this point, but one hour before landing, some 500km from JFK, it was announced that the Bose headphones would be collected. At first I thought they were kidding or had mistakenly announced it early and it would not happen for at least another half an hour, but no. Instead, we were given small earbuds which had a terrible sound. Luckily, they came with an adaptor so I could use that adaptor for my own headphones and carry on watching the film. It did seem a very strange, though. The Bose headphones are superb, among the best I have been given to use on an airline, and I’m sure they are very valuable. But collecting them with an hour to go is odd, to say the least. As we came in to land, the IFE screens had to be folded back, and so I missed the last 15 minutes of the film I was watching. We landed at JFK late at 1425 and then waited for a stand to become clear. Once the air bridge was connected, the doors were opened very quickly, and after disembarking the aircraft some passengers started running to catch their connections. I imagine whether they made those connections or not would depend on whether they were US citizens, because the queue for “visitors” which I joined took 30 minutes to clear immigration. I then went outside and waited for a cab for 20 minutes. The seat is excellent, although the IFE had problems. A day flight like this in a way focuses more on the seat for sitting at and working in rather than sleeping, and for that it works perfectly – the sleep test will come on the return flight (to be posted here in businesstraveller.com shortly). The other focus on a day flight is the service, and this was good in places, and not in others, depending – largely – on which flight attendant was present. The flight attendant who was mostly on our aisle was excellent. Boarding at Heathrow was disorganised. To read about the return flight two days later on the B777-300ER from Los Angeles, please click here.